- Launched in 2010, this project aims to stimulate nationwide interest in and boost the software industry. - To lay the foundations for cooperation and to build a productive software ecosystem where not only cooperative marketing activities are conducted by and between small and medium-size software companies in each sector, but where synergy effects are maximized by establishing a strong network and promoting cooperation between capable small and medium software companies in winning contracts, implementing marketing strategies, and entering global markets. Participating companies:cidow including 5 company A coordinative body composed of small and medium-size SW companies dedicated to building and supporting a web system which supports any platform, browser, device or person. This forum performs various activities and consists of specialized companies in the fields of web standard, web accessibility, and SEO. Participating companies: forbizkorea including 11 company The Cloud Service Forum was organized to raise awareness of the cloud service and to advertize and sell the service. The forum intends to be a syndicate, where strategies for opening and expanding markets can be developed, and joint sales and exchanges for entering a global market can be implemented. Participating companies: thinkforbl including 7 company The SW Testing Enterprise Forum aims to spread the importance of SW testing throughout the market and change the way people understand its worth. Active solidarity between member companies is pursued in order to increase opportunities for businesses and contribute to the advancement of quality competitiveness of home and overseas SW. Participating companies: TOBESOFT including 12 company As a syndicate of Korea’s leading specialized companies equipped with the technology and business experience required for collecting, storing, analyzing and utilizing Big Data, this forum aims for open innovation of the customer participation/business-academic cooperation type on the basis of joint brand "CyValue (Create Your Value)". Participating companies: Mango System including 9 company The Korea Open Source GIS Forum was established for various joint activities including advertizing and promoting open source GIS, sharing technology/marketing, and responding to government policy and major GIS enterprises. Participating companies: jinnetworks including 9 company This forum aims to enhance the productivity of manufacturers by jointly developing, converging, and providing IT technologies, products and services that will help raise the efficiency of management and manufacturing by applying recent ICT technologies to all job-processing environments, in order to strengthen national competitiveness and realize the creative economy. 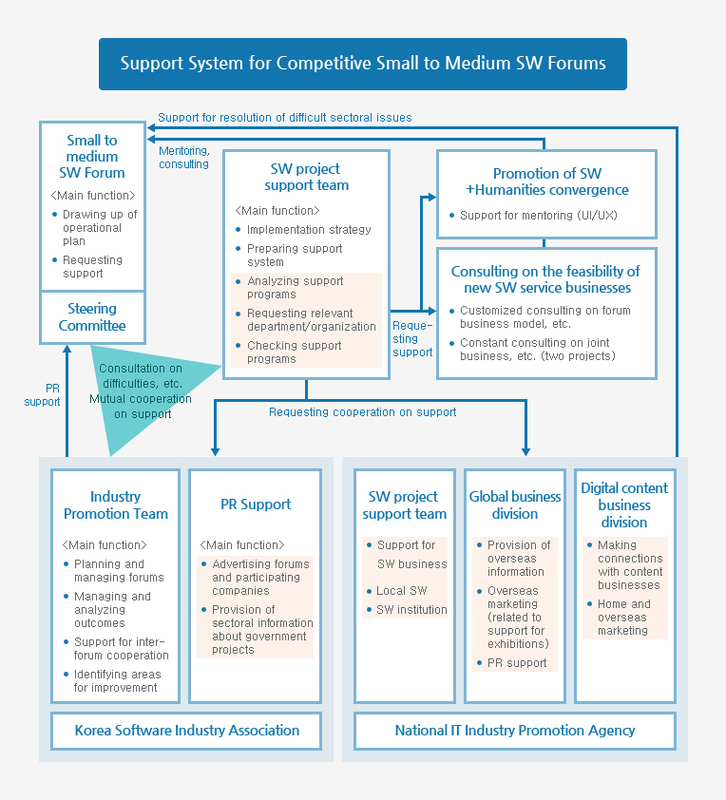 Participating companies: pison contents including 8 company Awarded the prize "Excellent SW Forum 2014", the Smart Ad Forum is a nonprofit forum maintained with the support of the Ministry of Science, ICT and Future Planning, the Korea ICT Promotion Agency and the Korea SW Industry Association. Smart ads now account for 28% of the ad market, which is worth around 3 trillion won. The current ad market trend is being driven by software, as the transmission of user-adapted advertisements by means of smart devices has become possible. In particular, the advancement of the algorithms of ad systems has led to the expansion of mobile devices, wearable devices and IPTV among others. The ad market looks set to continue growing through connection with N screen connected with e-digital signage or the internet of everything. This forum aims to develop a joint business model and to build joint home and overseas marketing strategies by sharing information and technology about smart ads (mobile, IPTV, digital signage, internet of everything, smart TV), in order to equip SMEs with autogenic power and competitiveness in the global markets. Participating companies: blmedia including 7 company This forum aims to establish a one-stop system ranging from development to commercialization by strengthening the network among enterprises in the digital signage sector, and to lead the DID market by developing two-way digital signage specialized in motion recognition UX. Participating companies: digitalDigm including 6 company This forum aims to build a cooperative system between domestic SW companies for researching and developing the Fin Tech Platform, and to raise the reputations of, and business opportunities for, small and medium-size SW companies through the Fin Tech Forum for domestic solutionization and a common platform in cooperation with the existing Fin Tech Forum and association. Participating companies: metabuild including 10 company This forum is developing a business model for the smart healthcare industry in order to create an industrial ecosystem, and is also conducting joint activities for market expansion, such as sharing the development of element technology. Participating companies: Umid System including 8 company The IoT-based Building Energy Big Data Forum is seeking to establish a business model for a competitive solution to energy management in order to implement joint marketing activities in domestic and global markets based on cooperation with specialized SW companies. Participating companies: morako including 6 company The “O2O Overseas Export ICT Convergence Solution Forum” was created to research and develop the O2O (online to offline) platform for Chinese Youkeas well as various distribution service platforms jointly to enable domestic small businesses to enter the Chinese market. Participating companies: webiztech including 7 company The Open Source APM Forum exchanges technical information about open source software, examines the requirement for APM cooperation according to the types of customers and solutions, and conducts marketing activities in order to expand the base of the open source APM.